In the world of 1950s cinema, Marty must have stood out like a big lunk among the glamorous images audiences were used to seeing. There are no beautiful-looking people or sets in Marty, In fact, it was distinctly, almost proudly, working-class. Marty also is a very brief film (at 94 minutes, it holds the record for the shortest film to win Best Picture). I would argue that its brilliance in its simplicity and gentleness and humanity, all characteristics that it shares with its title character. 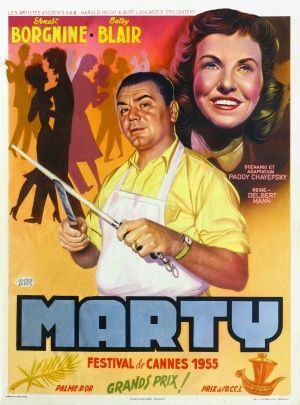 Marty is a simply wonderful film, one that even now, 61 years after its release, people can still relate to. It might not be as well-remembered as some of its other Best Picture winners, but it should not be forgotten. 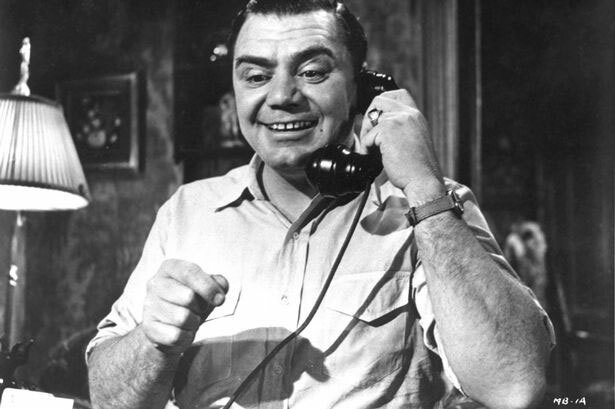 The story is very simple: Marty Piletti (Ernest Borgnine) is an unmarried 34-year-old Bronx butcher, the last of his brothers and sisters who still has not gotten married. He lives at home with his mother Teresa (Esther Minciotti), who openly despairs whether her son will ever marry. Marty too quietly despairs, aware that his social awkwardness and frumpy looks don't win girls over. He's had his heart broken many times and at this point seems settled to live as a reluctant lifelong bachelor. As far as his best friend Angie (Joe Mantell) is concerned, they both could live the bachelor life (though in truth, Angie isn't much of a player either). Prodded by his mother, Marty reluctantly goes to the Stardust Ballroom, where singles meet and mingle. He really doesn't expect much of anything there, but then things take an interesting turn. Coincidentally, a double date also goes to the Stardust, among them plain-looking teacher Clara (Betsy Blair). Her date is eager to dump the frumpy Clara and tries to pawn her off on Marty, but he is appalled at the idea of standing a girl up. Sadly, Clara is left behind for a better-looking woman, and worse, she realizes it. Clara is devastated at this latest rejection, but Marty finds her and soon they make a connection themselves. Marty and Clair leave the Stardust (leaving Angie there) and spend the night in glorious conversation, talking and laughing and falling in love. Marty and Clara finally find someone who cares about them, and both appear happy, with Marty agreeing to call her the next day after Mass for a proper date. However, soon Mama Piletti starts wondering whether it's a good idea for Marty to find someone to hopefully marry, especially given the situation with her sister Katerina (Augusta Ciolli). She has become a source of tension between her son Tommy (Jerry Paris) and his wife Virginia (Karen Steele) to where they ask their aunt to take Katerina in. Katerina warns Teresa that if her single son marries, the same can happen to her. Furthermore, Marty's friends, all single themselves, soon start pushing Marty to also let Clara go. He gives in and doesn't call in the afternoon when he promised. That night, as Marty is with his friends trying to figure out what to do that night, and Clara is at home with her parents, silently crying, Marty realizes that he is about to lose someone that he genuinely cares about and who cares about him. He rushes to the phone booth and tells Angie off. "You don't like her, my mother don't like her, she's a dog and I'm a fat, ugly man! Well, all I know is I had a good time last night! I'm gonna have a good time tonight! If we have enough good times together, I'm gonna get down on my knees and I'm gonna beg that girl to marry me! If we make a party on New Year's, I got a date for that party. You don't like her? That's too bad!" Marty ends with him on the phone to Clara. While it isn't shown, leaving things ambiguous, I have a sense she did agree to see him, and these two plain, kind people lived happily ever after. Paddy Chayefsky adapted his television play for the film version, expanding the original story for a feature-length run. Chayefsky was a simply brilliant writer and Marty shows what talent he had. The dialogue is so real and natural. My favorite is when Mama Piletti tries to get her son to go 'put on the blue suit' and go to the Stardust, where in her words, there are lots of 'tomatoes' for him. It's clear that with her Italian accent and curious use of a slang term she picked up, she has no idea how bizarre the term 'tomato' sounds to her son's generation. Marty finds the use hilarious, but we also see that in their argument over whether he'll go to the Stardust or not, Marty is a very hurt and lonely man, aware of his own shortcomings and how he doesn't meet the standards other men have. This is a beautiful scene because of its realism and how it plays out. This scene is something that I'm sure has happened in many homes, where a lonely man is pushed to do something he fears will cause him more heartache but does so anyway to please someone else. Marty also has some fine performances. Borgnine until now was usually cast as the heavy (of particular note was his role as the murderous Fatso in From Here to Eternity). Here he plays against type as the kind, gentle, schlumpy Marty, and he's wonderful in the part, simply perfect. Just in his non-vocal moments, when he closes his eyes and tightens his face, we see Marty's fears, hopes and disappointments at being rejected yet again and the quiet despair of a good man who cannot find love. Marty's goodness, kindness, and sensitivity underneath his rough exterior come through. The same goes for Blair's Clara. Blair makes Clara a gentle and sincere woman, not as confident as she could be given she is a teacher (and as such, more educated than the butcher). They have such wonderful chemistry on screen, and again I circle back to Chayefsky's script. When Marty compliments Clara by telling her, "You're not such a dog as you think you are," it doesn't come across as an insult because a.) that's how he talks, and b.) he calls himself a dog as well. He obviously meant it as a compliment in his own bumbling and endearing way. Honestly, if by the end of Marty you don't fall in love with Marty and Clara, there's flat-out something wrong with you. Credit should go to both Chayefsky and director Delbert Mann, who brought out the best in everyone. The subplot of the Italian sisters and of Marty's decision whether or not to buy the butcher shop from his retiring boss were quite well-integrated into the film, never coming across as add-ons or distractions. Today, and certainly in the 1950s, films tended to focus on the glamorous life and the beautiful people. Simple, short tales of honest, kind working-class people are few and far-between. As such, Marty, both then and now, is a bit of an anomaly. If you look at the films in the 1950s that won Best Picture, they tended to be either big epics (Ben-Hur, The Bridge on the River Kwai) or lavish productions (Gigi, The Greatest Show on Earth) or about the upper echelons of society (All About Eve, Around the World in 80 Days). With the exception of On the Waterfront, critically praised films weren't about the working-class, and On the Waterfront is a searing drama about morality. Marty, on the other hand, was a small romantic film about two ordinary people falling in love. Even today, in a market dominated by sequels, prequels, and comic book adaptations, massive action films and lowbrow comedy tend to be the ones being made. Sweet and unapologetically gentle films like Marty aren't either in high demand or much seen. That seems a terrible shame, and a greater shame that Marty is pretty much forgotten among its massive Best Picture companions like Gone With the Wind, Titanic, Lord of the Rings: Return of the King, or The Godfather Parts I and II. All those save Titanic are brilliant films, but they are massive, epic, while Marty is small, gentle and quiet. Still, Marty is one of my favorite films because I can so relate to its simple story of ordinary people like us, versus the 'ordinary people' of Ordinary People. Doris Day was right: Everybody Loves a Lover, and after seeing it, you'll love Marty too.